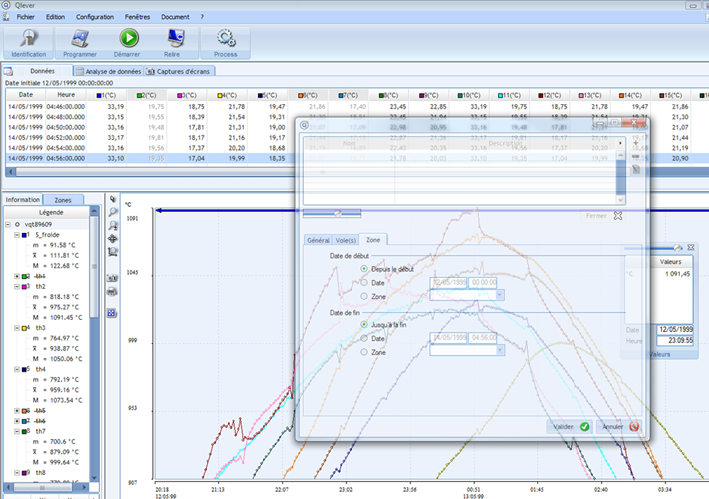 TMI-Orion Qlever software is regularly updated by our R&D lab. The new version 2.3 offers innovative features: universal thermocouple data logger management, creation of calculated relative humidity channels, dynamic pressure calculation. They are listed in this section. calculate and create industry oriented measurement and validation reports. Qlever software offers ease of use, flexibility and customization. Qlever: Software platform dedicated to the management of one or several TMI-Orion data loggers. Qlever Lite : Simplified software solution intended for managing a single wired TMI-Orion data logger. Cannot be combined with any of the sofware modules. - Qlever Process management for communication with PLC and closed loop control of your process. Dedicated to secure management of user access, with creation of different accounts and access levels (Administrator, approval, operator). Complete tracking of processes and data including any addition, deletion or modification operation (Audit trail). This module is also included in the Pharma module. Meets the requirements of the pharmaceutical industry. Dedicated to all thermal cycle analysis. Extensive measurement report with statistical calculations detailed by cycles and steps. Intended for analysis and validation of humid heat sterilization cycles and vacuum test. The pressure variation rate is used for the validation of the required perfomance of the packages materials compliant with EN 868. Data treatment and presentation in an extensive validation report in compliance with ISO 17665 / EN 13060 / EN 554 / EN 285. Intended for climatic and thermostatic chambers - or any kind of thermal regulation devices such as rooms, ovens, autoclaves - characterization and checking of temperature and humidity. NEW: Possibility of creating relative humidity calculated channels. Data treatment and presentation in an extensive compliance report with FDX 15-140 / IEC 60068.3.11. Intended for analysis and validation of washing-disinfection cycles. Data treatment and presentation in an extensive validation report in compliance with ISO 15 883. Dedicated to TMI-Orion temperature and humidity loggers calibration process: calibration, adjustment, checking and editing of a report. Available with a library of drivers, to communicate with a wide variety of calibration equipment: baths, ovens, reference probes. Delivers a calibration and adjustment report. Available with Expert mode, Automatic mode or Manual mode. Thermal profile mapping in various ponts of a cart load during the entire industrial curing cycle. Kiln description: kiln length and number, lenght and duration of pushes. Load description: positioning and 3D visualization of thermocouple probes, types and number of products. Kiln configuration: Position of burners, probes, fans, etc..inside the kiln. Pushes and events management: cart thermocouple probes temperature visualization according to cart localization inside the kiln.